On the second day of our weekend Zdon peak-athon, Tom and I were in the Inyo Mtns to tag a foursome most easily reached with the help of a 4WD vehicle. Tom had brought his Jeep for this adventure, getting good use out of it on our first day in the White Mtns along Crooked Creek. Today's driving would be on rougher roads and much longer. In fact, it would take us more time to drive the various dirt roads than the hikes themselves. In the morning we drove into the Cowhorn Mountains, a subrange of the Inyos found at the north end, between SR168 and the Death Valley Rd leading to Eureka Valley. 10mi of often rough driving leads to a saddle just below this unnamed summit which anchors the SW end of Deep Springs Valley. The hike to the summit takes little more than 10min, though with my van it would have been an all-day affair. The instrument-topped summit offers views south to Waucoba Mtn, west to the Sierra Crest, north to the Whites and northeast to Deep Springs Valley. A register we found here consisted of a small handful of loose pages dating back to 1950. The second oldest scrap was from MacLeod/Lilley in 1976 with Andy Smatko and Tom Ross visiting the following year. Brian French appears to be the most recent visitor in 2013. This is the highest summit in the Cowhorns, reaching to just under 9,000ft. Though Zdon describes a route from the west, we found a shorter approach from the north. Had we not gone to Peak 8,940ft we'd have probably used the easier drive to, and longer approach from the west side. From the north, our cross-country route was 3/4mi one-way with about 700ft of gain, climbing up through pinyon/juniper forest much like that we found on the first summit. The views were not appreciably better than Peak 8,940ft but the register had a few surprises. Comprised of a handful of loose pages, the oldest entry was from Walt Wheelock in 1959, probably while scouting for worthy summits for his 1962 Desert Peaks Guide, the precursor to Zdon's more recent and heavily expanded Desert Summits. The same crowded page included almost 2 dozen entries including ones from MacLeod/Lilley, Smatko/Ross and Bob Sumner, spanning 40yrs. The most recent scrap was left by Mark Adrian in March, 2015, with an April entry from Sumner's second visit - 16yrs after the first one. Our return was down a slightly different, more direct line, getting us back just under an hour after starting out. This is often considered the northmost of the major summits in the Inyo Mtns, rising to well over 9,000ft with 1,000ft of prominence. It was one of only five P1K summits (out of 172) over 9,000ft in CA that I had left to visit. This one proved the toughest drive of them all, some five miles from the pavement though only the last mile or so was particularly rough. Only a few miles from the pavement we noted a sudden change in the engine noise, not boding well. We stopped and got out to examine it. While I looked around the tailpipe, Tom seemed to know exactly what it was, walking around to the passenger side and looking under the car. Sure enough, the muffler inlet pipe had separated from the muffler, effectively taking the muffler out of commission. With some tools and copper plumbers tape among the helpful things Tom carried in the back, he managed to at least tie up the front end of the muffler to keep us from losing it (and there was no doubt it would have been shortly ripped from the undercarriage had we done nothing). And then back on the road. The last half mile of the road was excessively steep with very sharp switchbacks, just barely managable in the Jeep. The temperature gauge wasn't working, otherwise I think it might have indicated we were exceeding recommended limits. It was probably 85F outside even at 8,000ft and that last steep section must have worked the undersized engine to the edge. The road tops out at an old mine location at a saddle 3/4mi west of the summit. With only about 500ft of climbing, it made for a pretty easy ascent which took less than 30min. Unlike the earlier summits, this register was not even a year old, left by Terry Flood the previous July. Daria Malin had visited in January and more recently an OPG group that included Dennis Burge (whom I met in Ridgecrest) in May. The views? It was pretty warm and I don't think we bothered to admire them all that much. Not long before noon we were back at the Jeep. This unofficially named summit (named by Zdon for the summit benchmark) lies at the western end of Harkless Flat. The road out there was remarkably tame without any difficulties. Zdon describes parking about a mile further east, but we had no trouble driving right to the miner's cabin described in his writeup. The cabin, partially built into the hillside is in ruins, the roof long ago having collapsed. From the cabin the summit is a 10min hike to the north up sand/gravel slopes on its SE side. There was no register on this one, but on a lower subsidiary summit to the northwest is something resembling a wooden cross held up by guy-wires. It appears to have been erected by amateurs and there is some evidence (broken mirror pieces) that some experiments may have been conducted using it. After this brief diversion, we returned via the route we'd ascended. It was 2p by the time we'd returned back to the junction of SR168 and Death Valley/Saline Valley Rd where we'd left my van. Tom was heading home while I still had another day or two left to play in the mountains, so we parted ways. It was hot down at 4,000ft - 100F and there were few places I could go to escape the heat. After a quick stop in Big Pine for the largest cup of iced soda I could muster, I drove back up to the White Mtns where we'd started the weekend on Friday night. At 10,000ft it was far cooler, in the 70s, and much more conducive to hiking. I decided to hit up the two peaks we'd missed the previous day plus a few easy bonus summits not far from the White Mtn Rd. Less than half a mile from the roadway with 700ft of gain, Clem Nelson (Zdon has it as "Reeds Mtn") was too much for us to bother with at the end of the day yesterday. With more in the tank today, it was an easy climb that took barely 20min. Zdon had left the first of three register pads in 1988. Subsequent ones were left in 2005 and 2007. All told, there were more than 50 pages of entries, making it a surprisingly popular peak, most odd considering there's not even a vestige of a use trail that I could find. This was the summit that we found most frustrating the day prior. Located roughly halfway between County Line Hill and Bucks Peak, Blanco is only a few miles from the road but seemed so far when we were tired that afternoon. I used the same starting point that we'd found for County Line Hill and followed the route up the draw we'd taken to a saddle. From the saddle I traversed around the south side of County Line to a second saddle where I picked up an old road leading to a small, shallow valley west of Blanco. The cross-country travel from the road had little brush and the creek crossing at the base of the mountain was completely dry. Once at the base of the mountain the climb to the summit was much like Clem Nelson, slopes of disintegrating granite with decent footing thanks to the vegetation that manages to grow there. 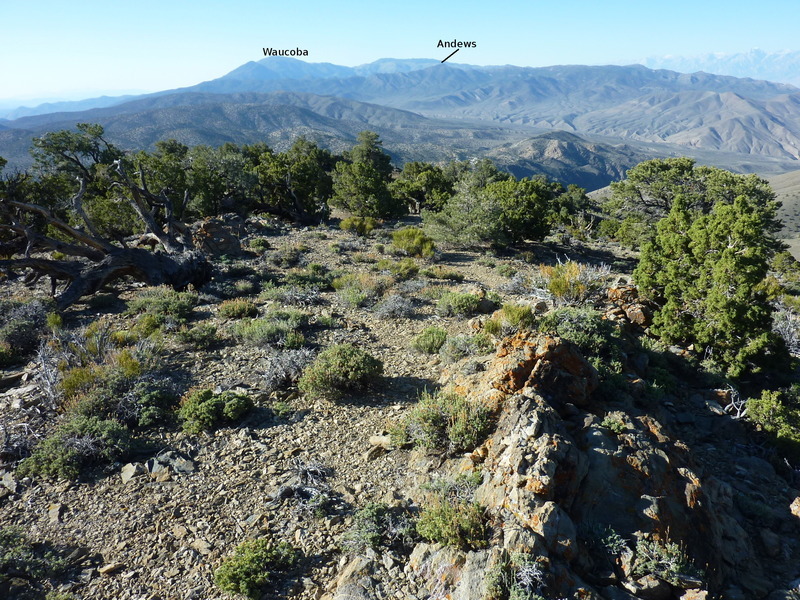 The pinyon and bristlecone forest stops just below the summit leaving the views open in all directions. I found a benchmark but no register among the collection of summit rocks. Following virtually the same route I had taken in, I returned to the van shortly after 6p, a two hour effort. Back on White Mtn Rd, I drove south a few miles to where the road tops out at a saddle near 10,900ft. The saddle is about 1/10th mile from the highpoint, about as easy a bonus peak as you can get. There are two summits, one on either side of the road and I guessed the wrong one in hitting up the larger massive to the east. Turns out the rocky west side summit is the highpoint. There are several class 3 routes to choose from up the impressive east side (easier routes walking around to the south side). I went up one gully and down another, short but fun scrambles. Though no register was found, the views are pretty good. I'm not sure how this summit got named on LoJ. The topo map doesn't show a benchmark or any summit named "Silver Peak". Maybe there was such a benchmark before they built up all the communication towers at the summit, some of them quite recently. Even easier than Peak 10,940ft, this summit two miles to the south can be driven up with a sufficiently burly vehicle. I deemed the road too steep to give it a try so I parked at the power substation (also quite new) and hiked the short distance in ten minutes. Amidst the towers is what looks like a two-story wooden viewing platform that can be climbed like a telephone pole to one of two wooden platforms. I don't think it's there for public use, but the views are improved with the extra height. Hi Bob, saw your entry in the Clem Nelson log. My first Bob Burd log sighting (that I know of)! I took the long way, from the visitor center. Cheers.